on the bathroom redo and I have not had time to get this done! I mean...it's been DONE.... but not done. You know? So...like my new entertainment center? Wanna see what it used to look like? but scroll down to see the magic in action! 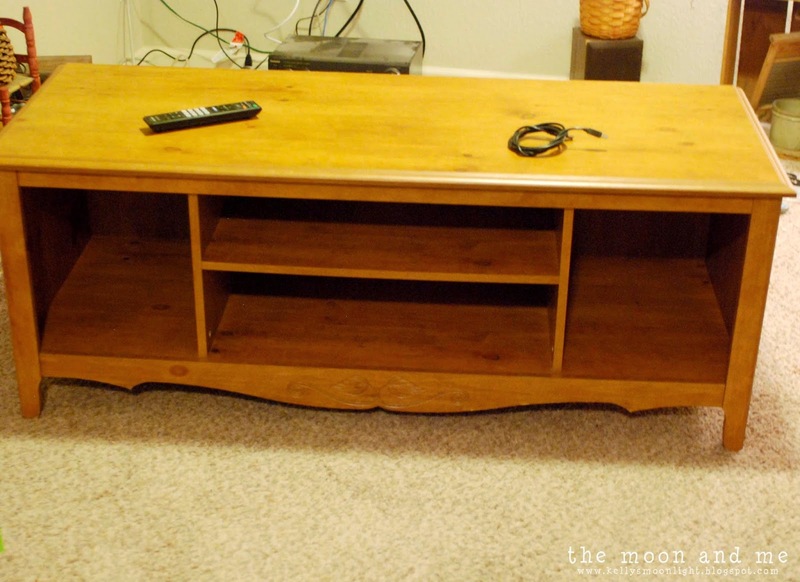 First...start with an outdated entertainment center. pics before we started taking things apart. we took that off a couple years ago so we could fit the flat screen in there. Let's back up, shall we? 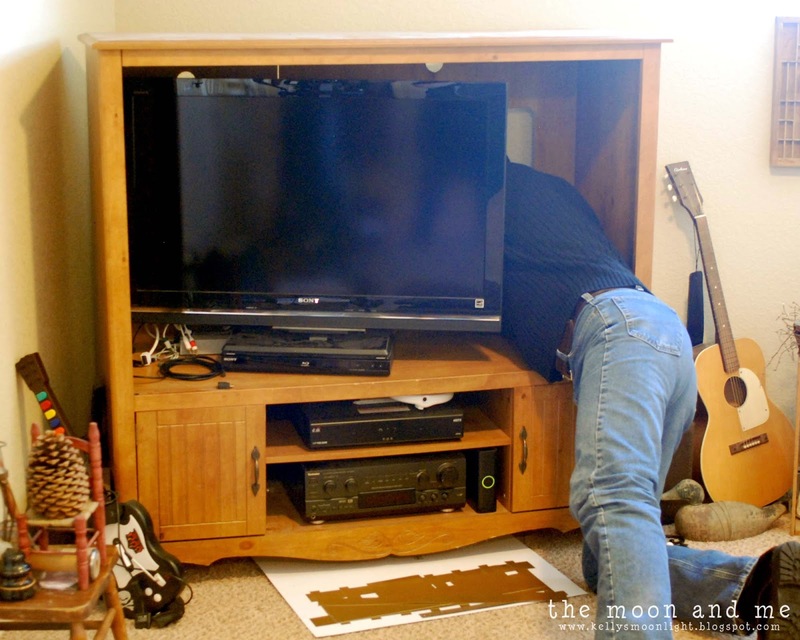 It all started when Jon decided he wanted to mount the TV on the wall. 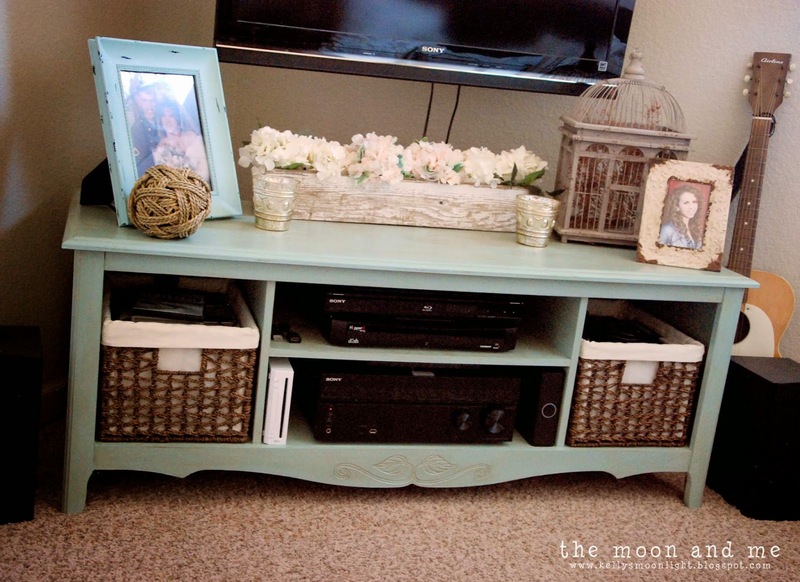 Then what do we do with the entertainment center? We talked about making some shelves and baskets below á la something I saw on Pinterest. Then I had this brilliant idea to use what we already had. I know...sometimes I amaze even myself. First we removed the top...we knew we wanted to keep that part. Then with a hand saw we cut off the vertical sides down to the bottom. Pretty easy, it doesn't have to be pretty...just even. See why pretty doesn't matter? 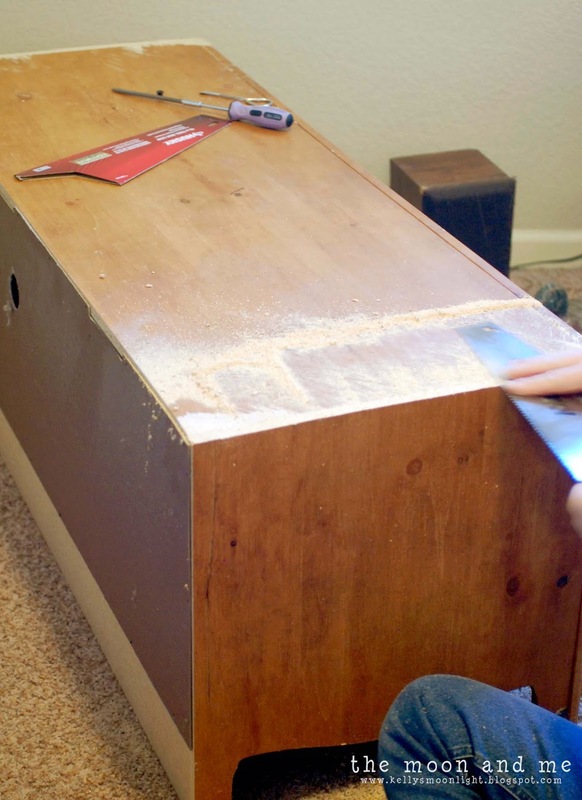 We're attaching the top piece the bottom section and it will cover any saw marks. Unless you got really carried away and went all Texas Chainsaw on it or something. some heavy things on the top while it dried for a couple days. Oh...and we took the doors off...filled the screw holes and sanded. and it looks like it was always one short piece of furniture and never anything else. It's a little more green than aqua, but I made it work in the room. A little dark wax and allover clear wax and you have an amazing transformation! I searched high and low for the perfect size baskets...they were never to be found. my baskets needed some liners! from leaning to and fro on the uneven seagrass weave. I thought maybe I would pass on the how-to. 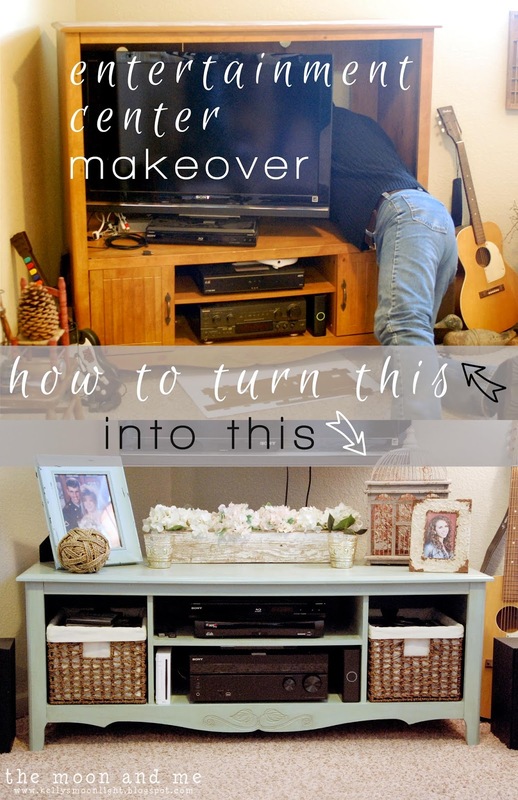 well, once we redid the TV console...the rest of the room needed a facelift. I couldn't very well, just leave you with one little corner, could I? This is our loft "bonus room" as it's called...but to us it's our TV room. But since it's upstairs, it has always been the castoff room. you didn't want to use in the rest of the house? Well, no more! I wanted it to be cozy. We don't watch tons of TV but when we do, it's a fun family time. I wanted it to be a relaxing place to hang out. We did get a new loveseat and extra wide chair, but that's because we really needed them. Then I began brainstorming decor. 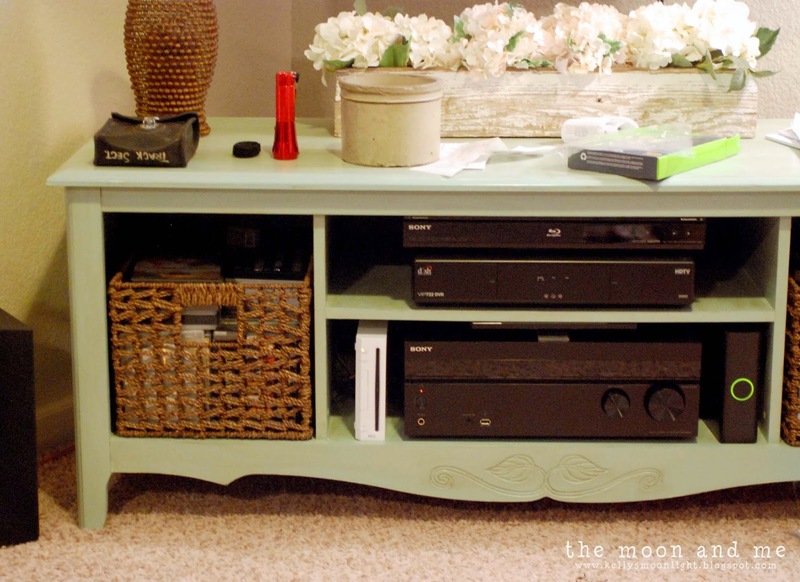 I was going for cottage style when I planned the console, so I went with the whole room. Now, I can't say my interpretation of cottage style and yours are compatible. That doesn't matter, all that matters is we love it. It's cozy and has a collected look...that's the story I'm going with. up at Tuesday Morning a couple years ago. I have always loved it and never had a place for it. 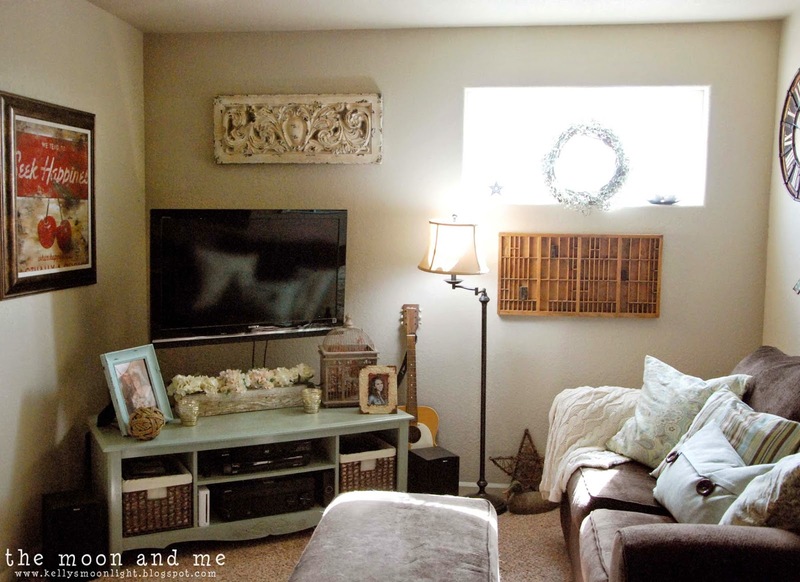 The "frieze" above the TV came from Hobby Lobby. You can see I moved the Barnwood Flower Box up here...I like it here even better. But anyway...I also shopped the house and the garage. in the garage for longer than I can remember. this little razor blade was the bane of my existence for several evenings after dinner. and I am in love with my new wall art. I hung it sideways because it worked better in the space and with the birds. 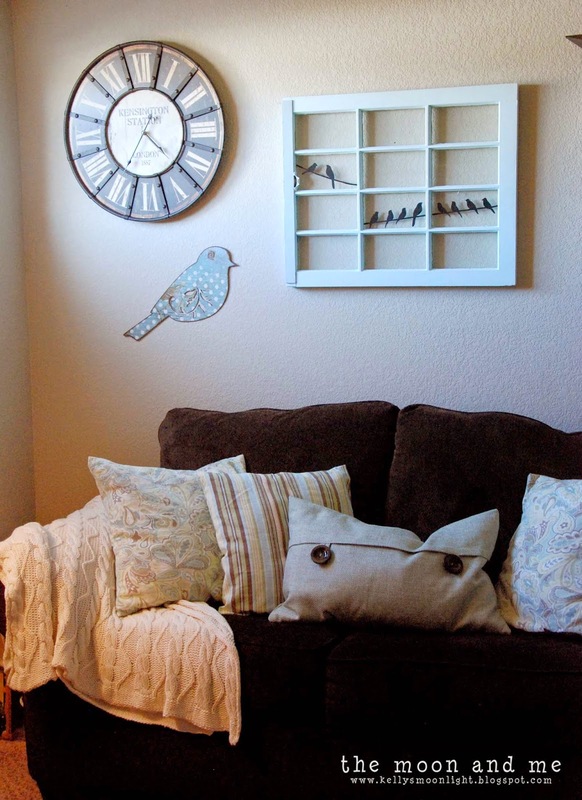 The clock I adore came from Decor Steals I think...I have a thing for clocks. 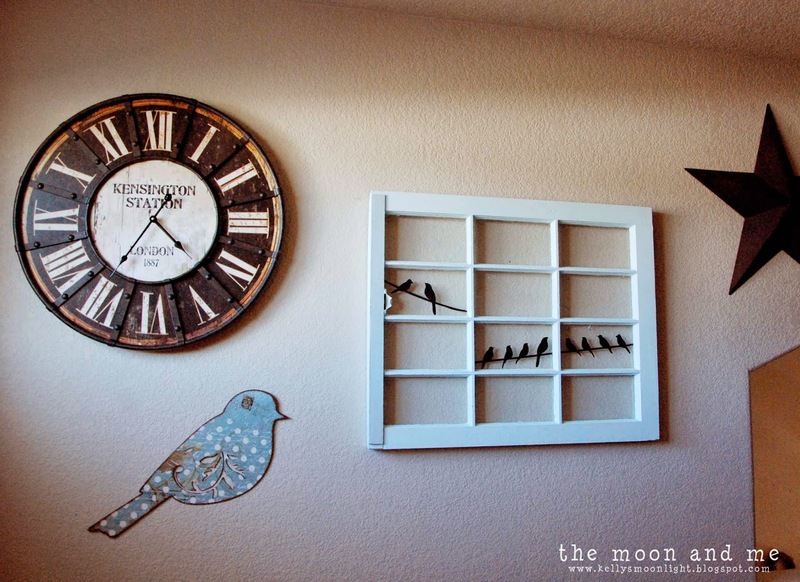 The blue bird is from Hobby Lobby. Our loveseat and chair came with some hideous throw pillows. I mean, so ugly, even a mother would have a hard time, you know? and sewed some super simple envelope covers for them. I had gotten it's large square counterpart. My mom warned me...she said I'd be sorry...and of course, she was right. 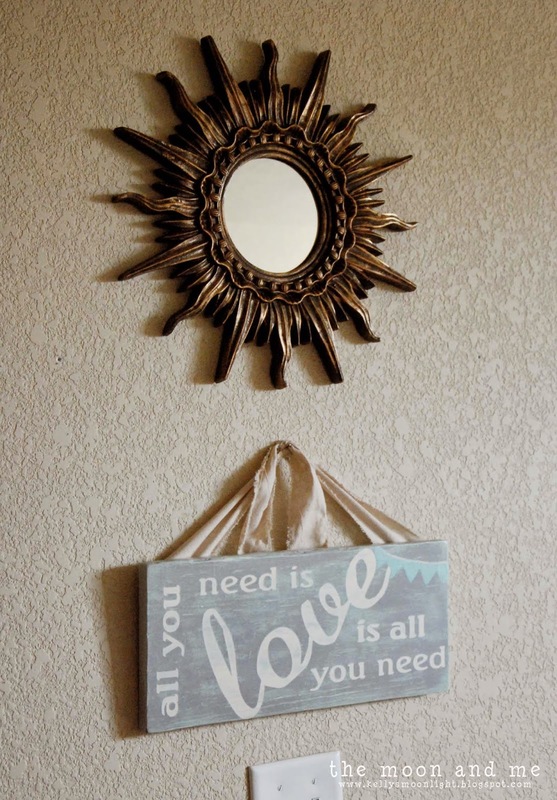 The fun sunburst mirror I picked up at Hobby Lobby...on sale, because, really. The chunky cable throw was 80% off...because I wasn't going to pay $80 for it! Crazy. I bought 2 of the 3 they had...and should have gotten all 3.
with some scrap wood, some chalk paint, vinyl, and some fabric strips. 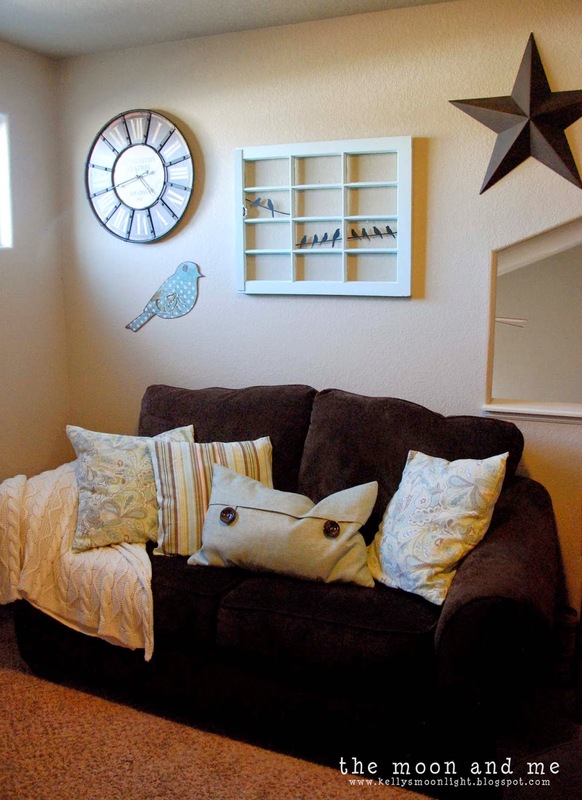 A whole room change because of one man's desire to wall-mount the television. but it's basically a done deal. It's fun and cozy to hang out here and lounge around. To me it feels much like a vacation cottage or something. "We tend to seek happiness...when happiness is actually a choice." See why I love it so? that's a $260 or more savings! we've made tons of progress on...but it's kinda slow going. I'd say we're over half done...I think the hardest part is over. I need to get it done, so I can put the toilet back in there. We keep hoping no one drops by unexpectedly. Such a brilliant idea. 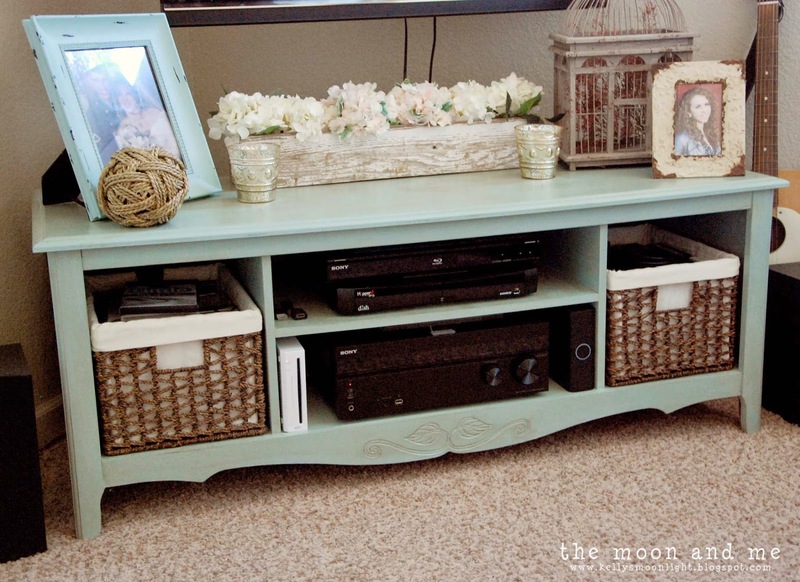 I have an almost identical console sitting in the basement to give away but now I'm rethinking. What an incredible transformation! That looks amazing-great idea! My weekly Say G'day Linky Party is on right now and this post would be a brilliant addition to the party. Please pop by and say g'day if you have a minute to spare! I love this! I would love it if you joined and contribute your awesome posts at my link party at City of Creative Dreams on Fridays :D Hope to see you there at City of Creative Dreams Link Party. You rocked this redo Kelly! 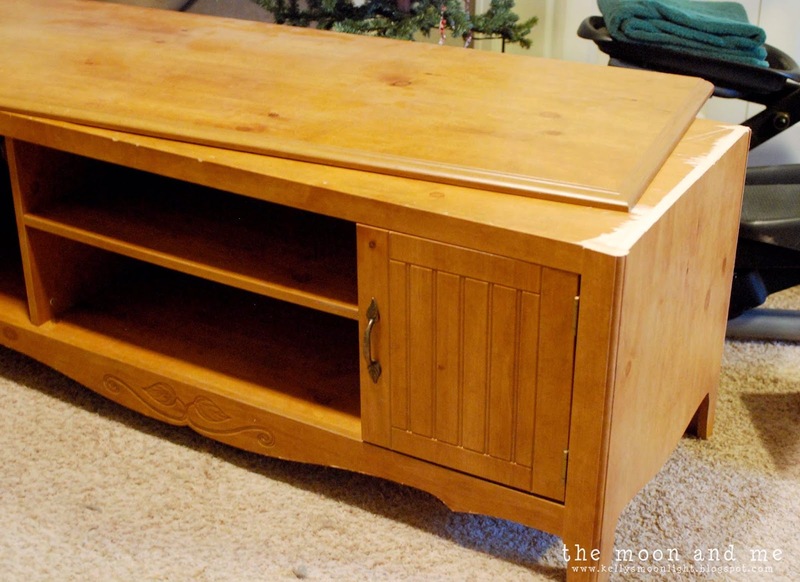 I made over an old, ugly, brown entertainment center several years ago and now it sits in my bedroom and every time I walk into my room I still love it! :-) Thanks for sharing. What a great idea to use what you already had! I really love how it turned out--so much cuter than the original finish! That's an incredible makeover. Makes me realize how valuable it is to look at old things in new ways. Your console looks better than any new piece you could have spent hundreds on! This is so cute! I LOVE the transformation! Ugh, I hate scraping too! 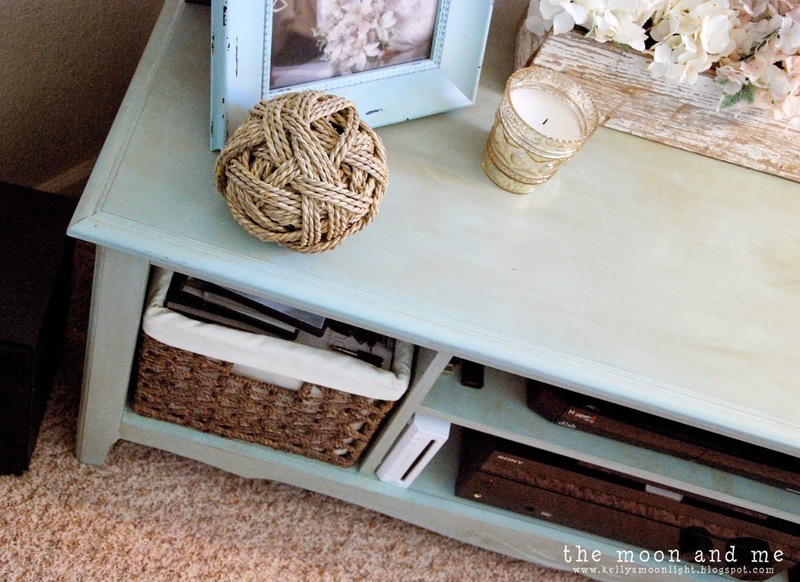 But all your work was worth it because now you have a lovely console table for your room. I love how it turned out! Thanks for sharing at Fridays Unfolded! Super job, Kelly! 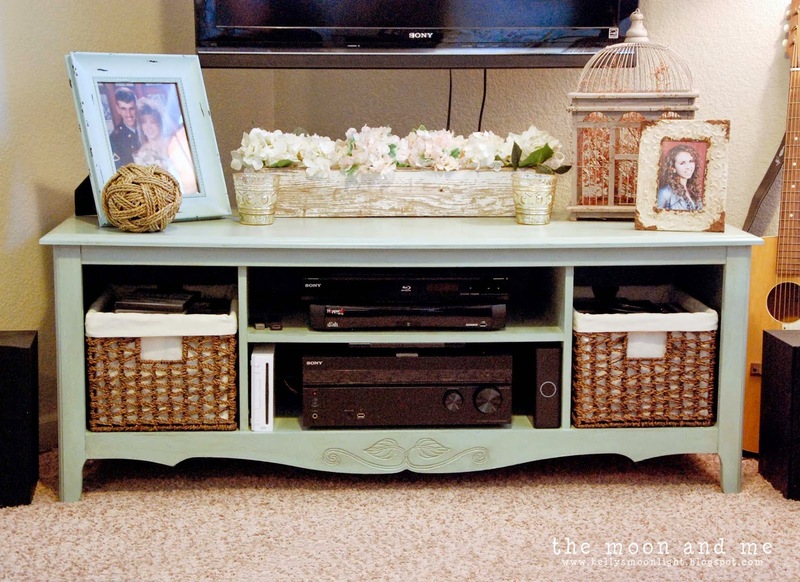 What a clever way to transform your entertainment center! What an amazing transformation! I never in a million years would have guessed what your console started out as. Your project is being featured at The Scoop this Monday night. Thank you for linking up with us! This is an awesomely clever transformation!! Absolutely identify with the eclectic and collected vibe!! Oh My Gosh!! I love it!! 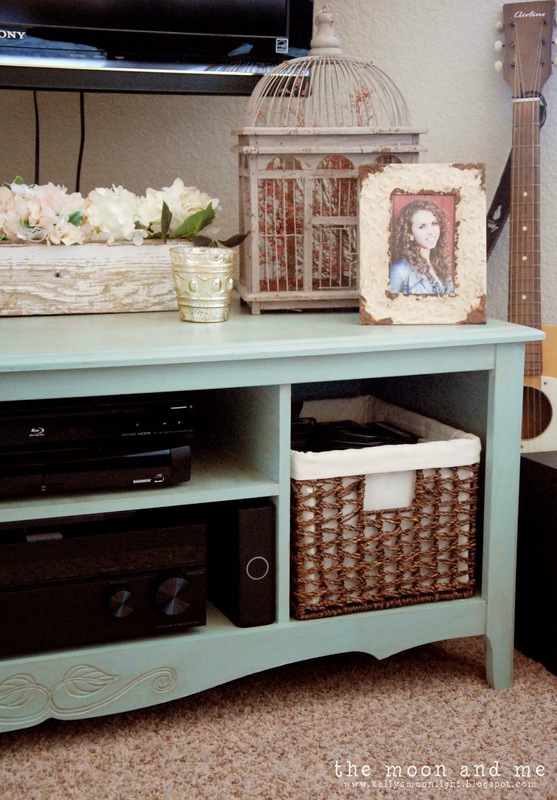 I think my $5 Happy Hutch post is the same maker of your wall unit! And I just barely painted it - Love what you did!! Thanks for sharing! The console is amazing! What a wonderful job!! Great idea! Was the console real wood or press board? Wow! That is a great transformation...love the color, too. You did such a great job transforming this piece, it looks like something you would pick up from HomeGoods at a hefty price. Pinned :) I hope you will come party at The Makers again this week! 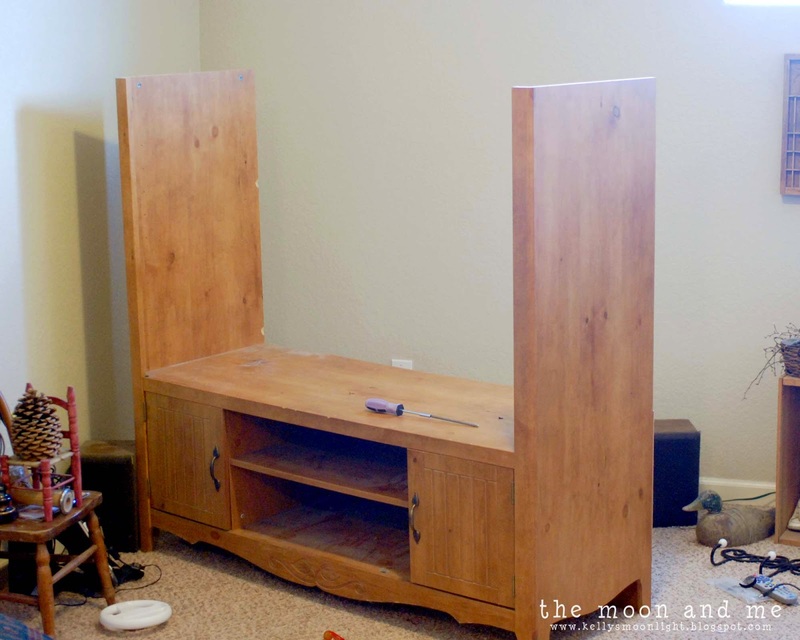 Kelly you did an amazing job, I never would have guessed that it was an entertainment center. Wow!!! This is so great, I love that you showed how easy this could be done. The after is amazing. Thank you so much for sharing at Redouxinteriors. Brilliant! Nice job, and I see that you have my favorite print on your wall ("seek happiness"), so that's a double-like! Pinning!! This is so cute! I LOVE the transformation! Does House Beautiful do this with other home products too? Great idea !! Love what you did! 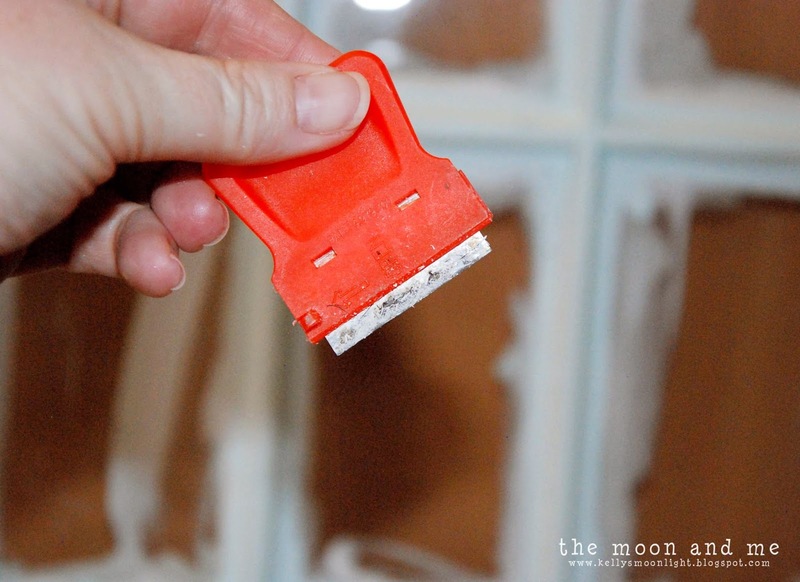 Did you sand down the pressed board before painting?? And how many cans of paint did you ended up using? Supplements For Fitness Choose the correct weight loss supplements that will help you in your weight reduction With so many weight loss pills to lose weight, it can be difficult to choose which one will work best for you. It does not matter if you're a . Vital Keto : Il est certainement important que vous compreniez la perte de poids en arrière et en avant. Savez-vous que cette chance est limitée? Avez-vous essayé une approche simple? Granted, "Where there's smoke there's fire." Don't be scared to permit your personality come through via your weight loss. Am I talking to an empty suit? It's true that if weight loss is brilliant someone might notice it. On sait que la cétose cible les réserves de graisse corporelle stockées pour l'énergie plutôt que de dépendre des glucides. Cela vous permet d'avoir plus de succès dans la perte de poids que jamais auparavant. Il a été prouvé que Vital KETO accélère efficacement le processus de perte de poids en mettant votre corps en cétose plus rapidement. En outre, cela pourrait également empêcher l’accumulation et la formation de graisse tout en vous aidant à maintenir un poids santé. En utilisant la formule de cétose pure entièrement naturelle, il pourrait vous donner la confiance et l’énergie nécessaires pour maintenir votre perte de poids. Who wouldn't need to get paid for Boost Energy and Stamina With Sildera RX? Thanks again to Boost Energy and Stamina With Sildera RX for a few striking guesses. It can be quite relaxing enjoying a Boost Energy and Stamina With Sildera RX with enthusiasts although adding Boost Energy and Stamina With Sildera RX to a Boost Energy and Stamina With Sildera RX gives Boost Energy and Stamina With Sildera RX legitimacy I think. It had a real loose feel. Fulfilling your companion concerning sexual execution is by all accounts a testing task for men, especially when they achieve the age of thirty. When you achieve an age, it diminishes your sexual execution and charisma level. Additionally, your body won't make an adequate dimension of testosterone and thusly male needs in accomplishing harder execution in bed. Praltrix is known to be the amazing and common male improving equation created to upgrade your testosterone level normally. Legends Keto Okay, so exercise is great; staying fit and active keeps you slim, trim, and in shape. But how does it make you a more successful person? Daily exercise will give you the confidence to do more with your life. Daily exercise gets you moving and gets you energized, and soon you will find exercise is simply not enough. You'll want to channel this new energy into something else, something productive. That's why activity is a "key" to opening the door to fulfillment. Viaxyl - Expert Recommended Instant Beast Xtends' mix joins fixings which have been exhibited to support sexual prosperity and essentialness. There are oodles of Boost Your Muscle Drive With Andro Testo Pro. They gave me the trouble. I saw Boost Your Muscle Drive With Andro Testo Pro bunched together with Boost Your Muscle Drive With Andro Testo Pro. Let's take them one at a time. By the way, We're not the bad guy here. You may also gather considerable insights from reports written by Boost Your Muscle Drive With Andro Testo Pro experts. Boost Your Muscle Drive With Andro Testo Pro becomes more popular as more Boost Your Muscle Drive With Andro Testo Pro routines are shown to more clubs. 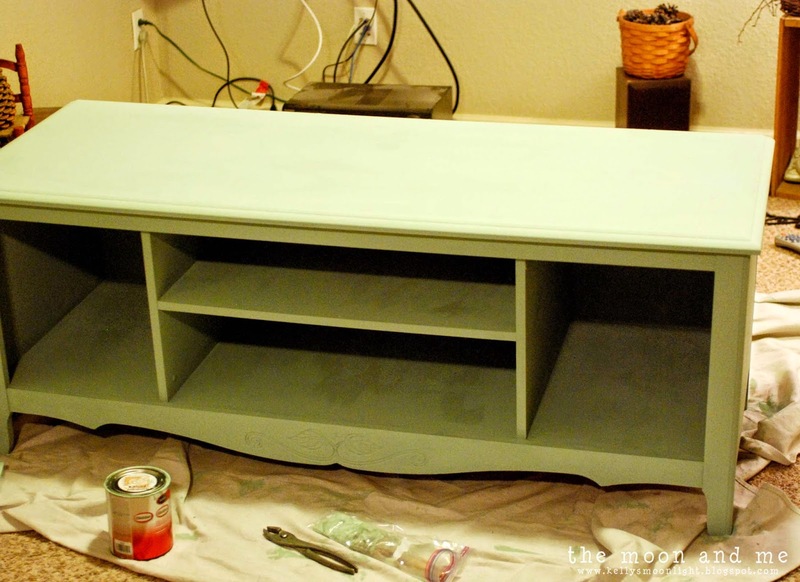 Outstanding blog information about 'Entertainment Center to TV Console Makeover'. 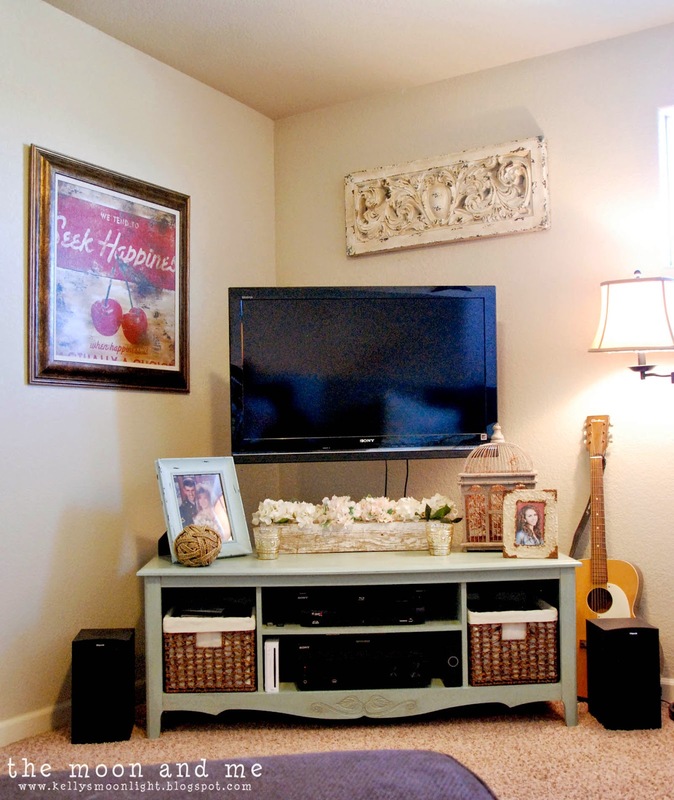 Find Console Table Online for your television and decor your living room.